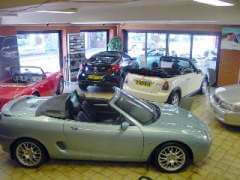 Welcome to Staddons, we are a MG specialist dealership with full sales and servicing facilities. 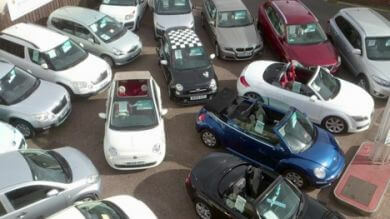 Staddons also specialise in the supply of quality low mileage used cars & vehicles from a wide range of manufacturers. We offer friendly professional advice to assist you in your purchase, & look forward to welcoming you in our showrooms at Budleigh Salterton & Exmouth. 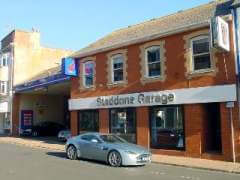 Staddons is a family owned and run business serving the local community and south west area. We are able to offer our clients a wide range of services including: New cars & Used car sales, Servicing, MOT's, Body repair shop, Valeting, extended warranties, finance* options, rental cars. As we have already mentioned Staddons can supply a wide range of vehicles from a variety of manufacturers, including new, pre-registered, demonstrators & used vehicles including small commercials and vans. At our Budleigh Salterton site you will find our service department, MOT test station, Body Repair shop, Forecourt with filling facilities, and our Shop which stocks a range of motoring accessories together with confectionaries, tobacco products, soft drinks & crisps. Our sales Showroom fronts the highstreet with a display of vehicles, from brand new to classics, manual and automatic, petrol and diesel, saloons, hatchbacks, MPVs Estates & vans. 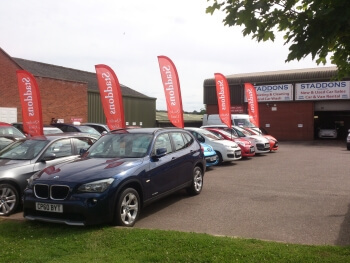 At our Exmouth site based in Pound Lane Industrial Estate, we have a large showroom and external display of a wide choice of vehicles from a large number of manufacturers. Our hire centre is also based here, with a choice of daily rental vehicles up to long term hire agreements. We also have an hand car wash service, and a vehicle preparation centre within which we can carry out professional valeting. Our service department is managed by Martin Coles who has been with the company in excess of 30 years; Nick Banton our Senior Sales Consultant based at Budleigh Salterton & our Exmouth branch is managed by Grenville Downing. All our departmental heads are experienced in their fields & are here to assist you wherever possible.